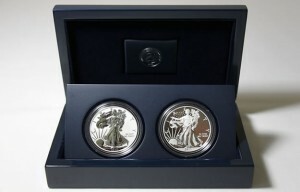 Market prices for the American Silver Eagle Two-Coin Set are higher than the original Mint price. All 2013 American Silver Eagle Two-Coin Sets from West Point have shipped. The last of the orders were sent last week, or almost 3 1/2 months after the sets went off sale on June 6, 2013. All coins for the set, a reverse proof Silver Eagle and a first ever enhanced uncirculated Silver Eagle, had been struck for some time by the West Point Mint. Shipping delays were the result of a shortage in custom packaging materials made overseas. While some collectors who had to wait weren’t happy, they can now take joy in the beauty of the enhanced uncirculated Silver Eagle along with strong secondary market values of their new set. Sets graded PCGS PR70 & MS70 averaged $316, with the low end at $299.00 and the high point at $379.99. Sets graded NGC PR70 & MS70 averaged $268, with the low end at $230.00 and the high at $309.95. Sets graded PCGS PR69 & MS69 averaged $188, with the low end at $170.99 and the high at $199.99. Sets graded NGC PR69 & MS69 averaged $168, with the low end at $150.00 and the high point at $199.95. At some point, the United States Mint will likely update how many 2013-W American Silver Eagle Two-Coin Sets it sold, with cancellations and returns trimming its last reported sales figure of 281,310. CoinNews.net will publish any updates, if released, as well as revisit secondary market prices. I wonder how much the mint saves by getting the packaging overseas? And it doesn’t hurt to get your coins graded, if you are going to sell your coins years from now. I second the point about grading it, if the intention is to have it as an investment.